Based on X-rays (specific views), your dental surgeon will determine exactly where each implant should be placed and which sizes should be used. Appointments will be scheduled. An impression of your mouth will be taken. – A temporary tooth may be placed on the implant for aesthetic purposes: it will have no chewing function. Normal activities can be resumed a few hours after the surgery. You will be able to return to work the next day and rapidly eat soft foods. To relieve any pain or discomfort you may feel after the surgery, pain killers can be prescribed by your dental surgeon. More detailed information is provided in section “Implant follow-up and aftercare”. Has your jawbone insufficient bone to support dental implants? A variety of bone augmentation techniques are available allowing dental implants to be placed. A detailed protocol has been designed for each technique. 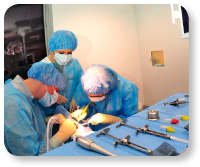 These procedures are widely used and involve: use of various bone replacement materials, use of bone substitutes, sinus lift ….). Your dental surgeon will discuss with you all of the options available to you.